We went for a walk yesterday and collected pine cones from the local golf course* – some to add to the nature collection we started at our friend’s holiday house, where we are currently staying, and some to make some of these…. 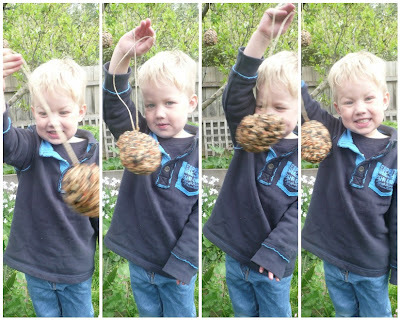 Attach some twine to a pinecone, smear it in peanut butter** and roll it in some birdseed. Hang it in a tree and wait for the birds. 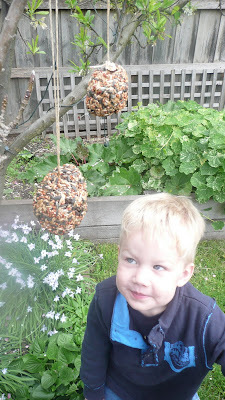 So easy for kids (or adults***) to make. * why are there always pine cones at golf courses?! **or in this case a delicious peanut butter substitute made of sunflower seeds. Heading off on a nature walk is one of our favorite things to do while down at the beach. We left our friends who own the holiday house in Point Lonsdale some new additions to the nature bowl we started when last we were there. It is the perfect time of year to go on nature walks in Australia. Collecting whatever bits and pieces of nature you find along the way. But, what do you do with the collection once you’ve got it all home? We sometimes try sticking it to paper for some creative art pieces or to plaster of paris like this. We have a bit of a beachside nature collection thing going on our bathroom shelf. 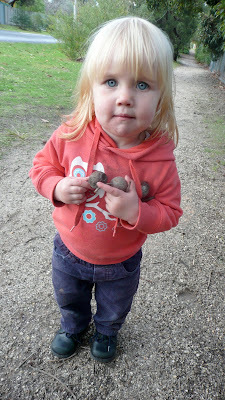 This photo is of my daughter exploring her Granny’s ‘Nature Box’ which has developed over my life time. It even includes a dried frill-necked lizard and a sheep skull! Yesterday we started our own ‘nature box’ containing a few insect wings and some seed pods. Although it doesn’t hold anything quite as creative as Granny’s ‘nature box’, we will certainly be on the lookout! Soulemama & Sarah have nature tables. Lou uses it for artwork. Granny writes letters on it. How do you bring a bit of nature in to your house? Growing up, whenever we had a beach holiday, Mum would get us to make a piece of art using shells and other bits and pieces we found along the beach. We used a disposable foil pie tin filled with plaster of paris, lightly placing our design on the top. These were then hung and displayed on the laundry wall until the next beach holiday came around. This Good Friday we spent the day with my extended family “out the bush” just outside of Heathcote, Victoria. We had a good old fashioned Aussie BBQ on the metal plate above the fire we had made ourselves. We had egg and spoon races (with the eggs mentioned in the last post), three legged races, an easter egg hunt and a “nature walk”. The “nature walk” was Mum’s idea. She gave each of the kids a bag and asked them to collect things that they liked around the bush. The kids quite enjoyed it, especially when two very dried kangaroo skulls were found! 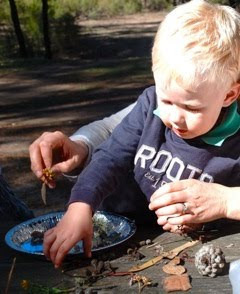 She then pulled out the foil pie tins and the plaster of paris and the kids made their own piece of nature art. No, the skulls are not in the artworks, but a few cicada shells are. Mum wrote their names and “Easter 2010″ on the back and an old tradition was passed down to the next generation. If you are going to give this a try, just remember to add a small piece of looped wire to the pie tin before you pour in the plaster, to use as a handle if you want to display your lovely artworks on your ‘laundry’ wall! addition – see here for a sneak peak at the 2011 nature plates!